A new campaign to increase the number of teenagers from South Yorkshire going on to higher education has been given a boost. 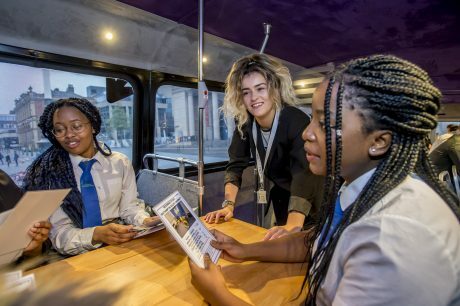 Education chiefs from the Higher Education Progression Partnership South Yorkshire (HeppSY+) have launched a mobile classroom in Sheffield city centre today – Wednesday, October 18th. Our team of Graduate Interns will tour the region giving talks and workshops on board the double-decker bus to classes of 14 to 19-year-olds from 38 secondary schools and colleges as well as to parents and teachers. A ribbon cutting ceremony, attended by HeppSY+ representatives, was held at Barkers Pool to mark the official unveiling of the mobile classroom – which gets on the road today for six months. Around 20 students from UTC Sheffield City Centre campus attended the ceremony, and are some of the first young people to road test the new vehicle. The UTC students had a tour of the bus, and listened to talks from the HeppSY+ graduate outreach team. 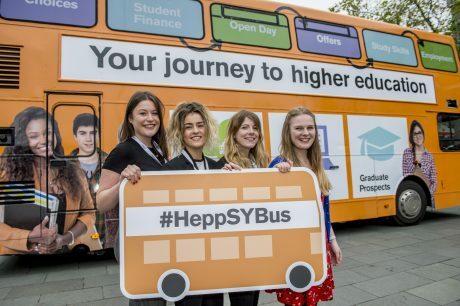 The launch of the double decker mobile classroom marks the first stage of a four-year HeppSY+ campaign to double the number of young people going on to degree level courses and apprenticeships in 45 target electoral wards. The campaign will provide outreach activity in Barnsley, Doncaster, Rotherham, Sheffield, North East Derbyshire and North Nottinghamshire. Research shows that fewer young people in those areas go on to a university level education at either a further education college or university. Follow us @HeppSY+. The mobile classroom is fitted with a suite of laptop computers on the top deck, and has an informal meeting area at ground level. Activities on board will include information, presentations, quizzes, question and answer sessions, and the chance to search for university level apprenticeships and courses online. HeppSY+ has recruited five graduates for the outreach team, appointed as higher education engagement assistants. More graduates will be appointed next month. The HeppSY+ programme is impartial, and is led by Sheffield Hallam University in partnership with the University of Sheffield, Barnsley College, Doncaster College, The Sheffield College, RNN Group, which comprises Rotherham College, Dearne Valley College and North Notts College, and the Higher Education Progression Partnership (HEPP) for Sheffield City Region. HeppSY started in July 2017.